This lunch dish provides all the nutrition you need to keep you energized throughout the day. It's light and refreshing and is best served with a side of fresh, organic fruit and a cold glass of distilled water. Chop and dice all your vegetables. Add an amount of Vegenaise so as to make all of the leafy greens stick together. Obviously larger amounts of vegetables means a little more Vegenaise. Add mustard to taste. 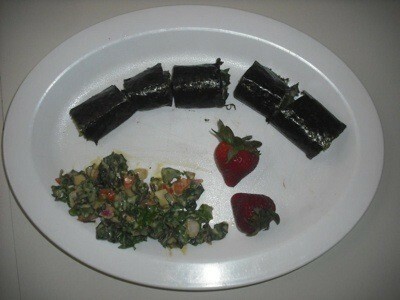 Slightly moisten Nori and lay it flat on a plate or clean counter. Quickly add mixture with a fork or spoon to one end of the Nori. Roll as if rolling a tortilla. You'll want to do this step quickly because the Nori gets harder to work with if you let it sit too long after wetting. Cut into sushi sized pieces. Serve with fresh fruit.